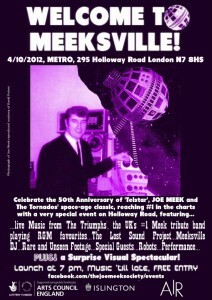 The Triumphs played at the Welcome To Meeksville gig to celebrate the 50th anniversary of ‘Telstar’ reaching no. 1 in the Charts. Clem Cattini and Roger LaVern who played on the original record attended. 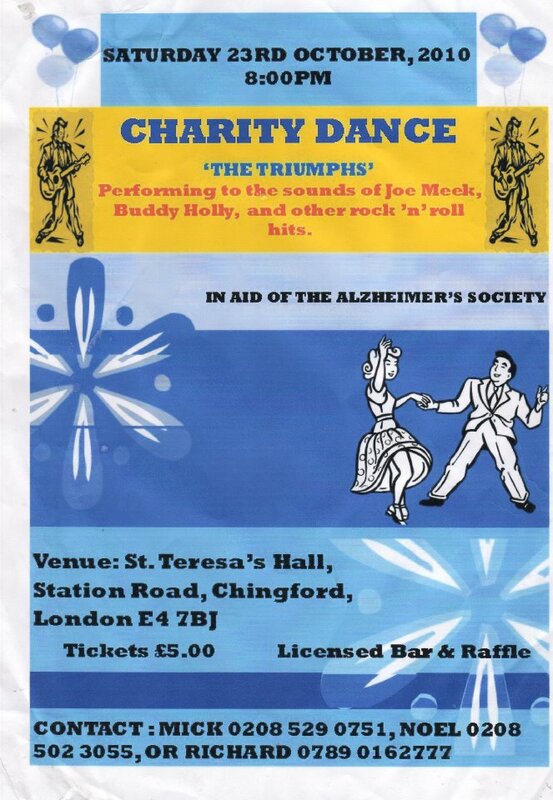 At the Ace Cafe London on Saturday 4 February 2012 the Triumphs presented a Buddy Holly Tribute show which used a selection of the material used by the acts who appeared at the Surf Ballroom at Clear Lake Iowa USA on that fateful night of Monday 2nd February 1959. The acts who appeared on that show were Frankie Sardo, Dion and the Belmonts, The Big Bopper, Ritchie Valens and Buddy Holly and his touring Crickets. Malcolm Lenny a member of Joe Meek’s band the Packabeats (remember they played the theme from The Traitors over the opening credits of the feature film Telstar) performed with the Triumphs. The Triumphs, the UK’s top Joe Meek Tribute Band, played at The Screaming Lord Sutch Birthday Party Celebration on Friday 11th November at Ruislip Conservative Club, all proceeds going to the Willen Hospice. It was in fact the legendary Joe Meek who produced Lord Sutch’s greatest records including the most famous of which was ‘Jack the Ripper’ which they performed with Lord Toby Jug on vocals on the night. 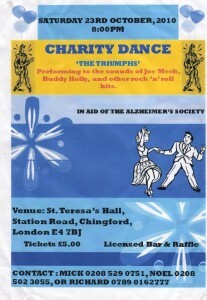 All proceeds from the dance were to the Alzheimers Charity. 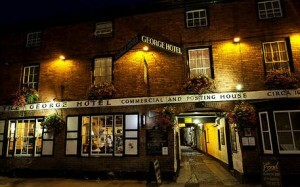 THE TRIUMPHS PLAYED AT THE GEORGE HOTEL IN NEWENT GLOS. 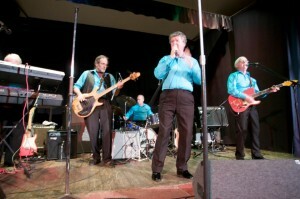 Mike Read guested with the group. 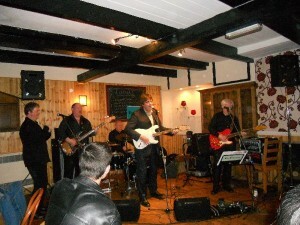 The Triumphs appeared at the Ace Café‘s Joe Meek Night on Saturday 5 February 2011 with special guest artists. Former Joe Meek artistes Ray Dexter, whose Joe Meek recorded output includes ‘The Coalman’s Lament’ and Atlantic Twist’, and Malcolm Lenny, lead guitarist with the Packabeats, whose Joe Meek recorded output includes ‘The Theme from the Traitors’, ‘Evening In Paris’ and ‘Time Goes By. 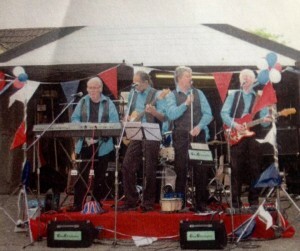 Just a few words to say last Saturday’s Gig was a big success and thanks to ‘The Triumphs’ we made £550.00 for The Alzheimer’s Society. 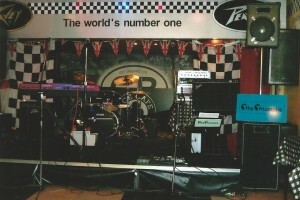 Everyone really enjoyed the Rock ‘n’ Roll music. What surprised and pleased me most was people were participating fully in the event by dancing, singing along or just tapping their feet to the music. It was one of the best ‘feel good factor’ events I have ever attended. Many thanks again to the group. 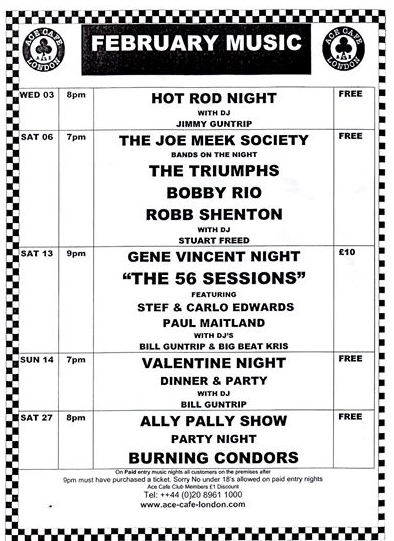 On 6 February 2010, following the Joe Meek Society’s AGM, the band performed at London’s iconic Ace Cafe. The Triumphs performed two sets that night. In addition, among those artistes who came up on stage and were backed by the Triumphs, were Bobby Rio (aka Bobby Cristo) and Danny Rivers. The band backed Bobby Rio and also performed a set in its own right at Amersham Rock and Roll Club on 10 April 2010. The Triumphs were the support band for the Tornados at the 2007 Joe Meek Festival held in Newent and have also played at the last three Joe Meek Society AGMs. These were held at the Square Pigg in Holborn, Central London in 2008, The George Hotel, Newent in 2009 and the Ace Café, North Circular Road, London in 2010. 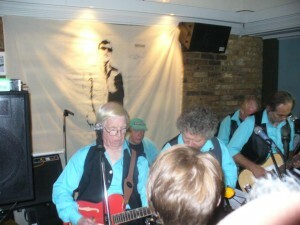 The band also played at the prestigious Phibbers Bar in the Holloway Road on 4 February 2009 to commemorate the fiftieth anniversary of Buddy Holly’s death in February 1959 and Joe’s death on the same day in 1967. This is a private pressing available only to Joe Meek Society members. Joe Meek Medley – Telstar/Johnny Remember Me/Have I The Right/Just Like Eddie. 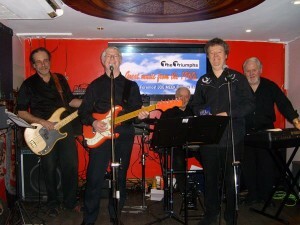 The Triumphs performed at the Joe Meek – The Farewell Concert at the Amersham Rock and Roll Club on Saturday 10 April 2010. 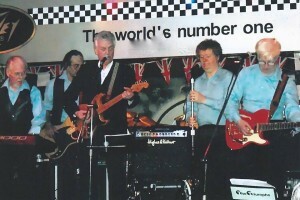 The band played Little Sister (Danny Rivers); Bless You (Peter London); and Telstar (The Tornados) and then became the backing band for Bobby Rio, aka Bobby Cristo – who recorded a number of great tracks for Joe, including Value for Love; The Other Side of the Track; and Boy Meets Girl. Bobby sang The Wanderer (Dion), My Prayer (The Platters) and Have I the Right (The Honeycombs). Ex Joe Meek artiste Rob Shenton was the compere. 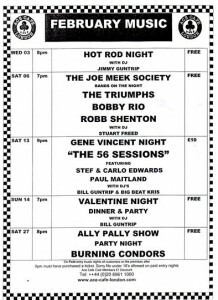 The Triumphs were the support act for the Saints, who included Joe Meek artiste Rick Winter and two of Joe’s star acts, John Leyton and Mike Berry who were backed by The Flames. 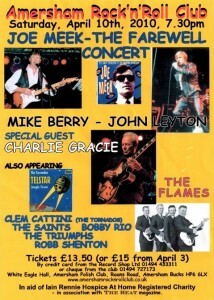 American rock and roll star Charlie Gracie was also on the bill and he too was backed by the Flames. 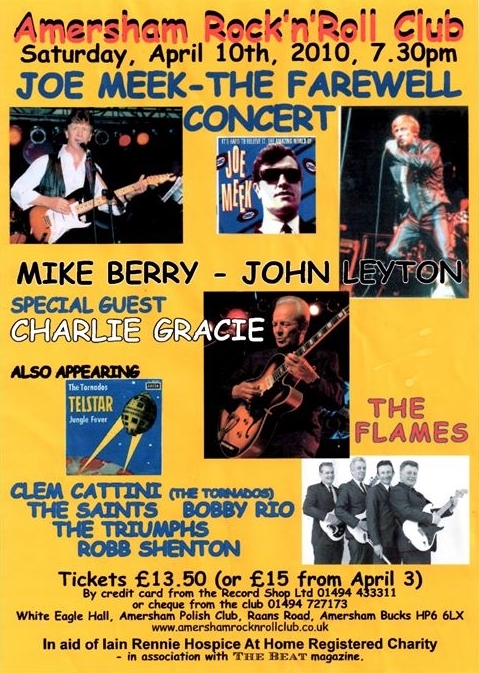 It was a truly atmospheric night of great performances and great music and more than equalled the excitement that prevailed at the Joe Meek Fest on 3 February 2007 at the Wyllyotts Theatre, Potters Bar. The Twangs For The Melody album featuring The Triumphs is now available on download on I-Tunes, Amazon and other download sites. 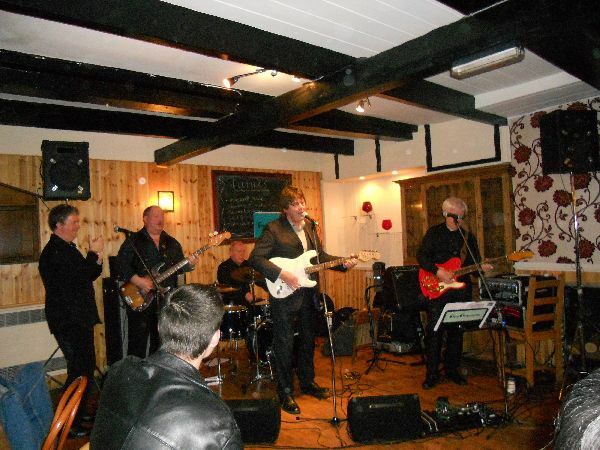 Press Release October 2009 – Joe Meek Tribute Band make major CD debut. Lone Rider Records latest CD release ‘Twangs For The Melody’ available from Monday 12th October includes 2 newly recorded tracks by top Joe Meek Tribute Band ‘The Triumphs’. The 33 track CD compilation pays Tribute to Instrumental Greats Of The 60’s with The Triumphs paying tribute to ‘The Saints’ and ‘The Outlaws’ with their own unique versions of ‘Wipe Out’ and ‘Husky Team’. 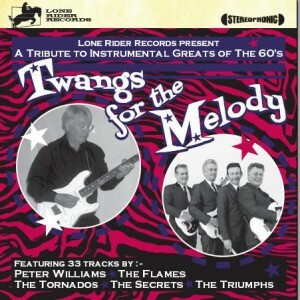 Other tribute tracks to the music of Joe Meek include ‘Telstar’ by guitarist Peter Williams, ‘Ridin’ The Wind’ by The Tornados ‘Jaywalker’ by John Leyton’s regular backing group, ‘The Flames. The CD also contains a 16 page booklet with copious liner notes by Rob Bradford of The Joe Meek Society. Full ordering details are available at www.johnleytonofficial.com or telephone Lone Rider Records 0208 943 9953.